Mary comes to optometry from a long and varied career as both an entrepreneur (as founder of the award-winning World’s Greatest Ice Cream Company) and a manager for national companies (including Starbucks, GAP and Pinkberry). The one common denominator in all of her pursuits has been an intense focus on customer experience, with the goal of welcoming a happy patron who leaves even happier. 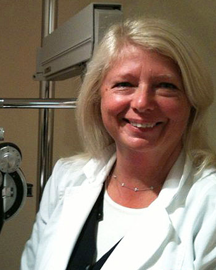 Besides being a trained Optometric Technician, Mary is also in charge of overall operations at Dr. Sam’s Eye Care. Her overarching goal is that in delivering the highest quality eye care at a reasonable price, every point of patient contact at Dr. Sam’s leaves you feeling glad you came. Mary’s favorite color is blue. Her favorite thing to look at is her husband, the eminently handsome Dr. Samuel Giveen.